It is a REALLY nice knife! Could anyone put up the Forsaken Steel Heart next to a CGFBM? 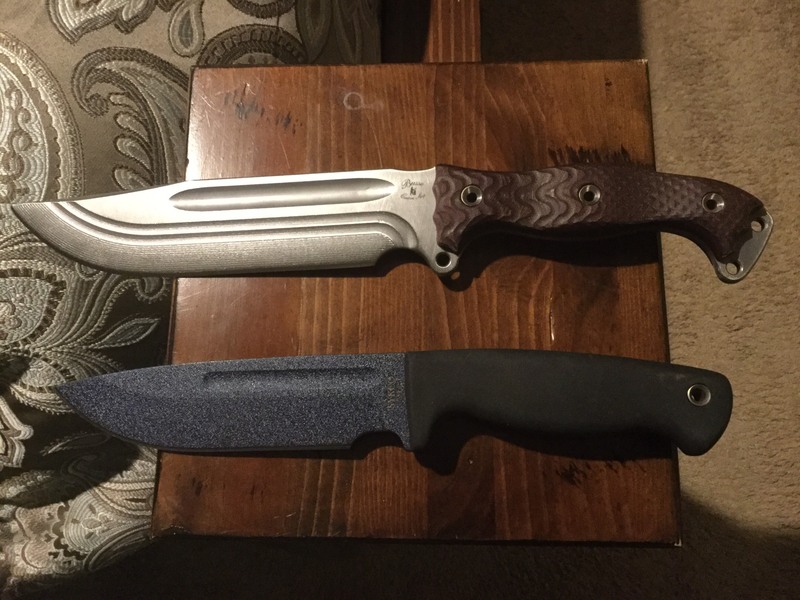 I would like to see how well it looks while side by side since CGFBM has been my grail knife since 2005 or whenever it was released. If not CGFBM, Huck Finn is next best. Hey LadyEarth! Check out page 19 of this thread. . It's really great. Yes the handle is small (edit: it's actually not that small after measuring, see NFNO Nano handle question thread), but super comfortable, almost delicate..? Not a word I typically associate with Busse. The whole package is really light as well. This may be the perfect thickness for INFI. Here are some comparison shots with other fusion handles. Oh my heart! Now I need all three (CGFBM, Huck Finn, and Forsaken Steel Heart) together in my collection. nydude and duramax like this. Got my shipping notice today. One in Nuked CF with Maroon Canvas and one in Desert Sage with Black Canvas. Just took delivery of my maroon on CF today. Handle is... interesting. Not sure how I fell about it. It’s about like the difference between a Gen 3 Glock G17 and a Gen 5 G19X. Very subtly smaller, but definitely noticeable. If someone has size Large glove hands, I wouldn’t be surprised to hear them say it’s too small. I’m not even sure it’s not too small for my size small-medium glove hands. But I LOVE the regular size fusion handle. This will probably grow on me. But it will take some use to get there. Shipping ding for Nuked comp tan micarta. Arrived wed.
My nuke arrives tomorrow. Pretty excited to get this in hand. I used mine a bit over the weekend, have large hands, and think it's too small for hard chopping, as preferences go. 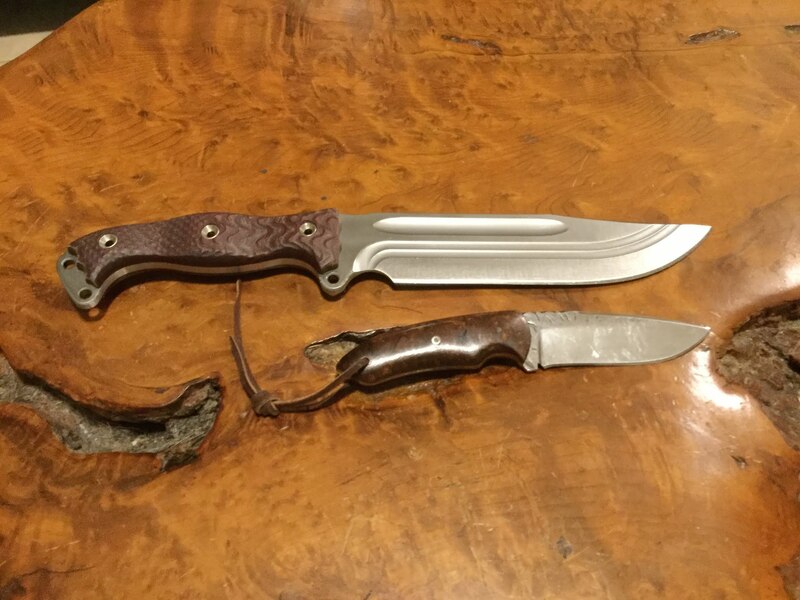 It feels a lot more like a big bushcraft or hunting knife where the handle fits well for non-aggressive tasks. It batons really well somehow. I didn't get much hand shock at all, nearly as good as a resiprene handle. I think there's either a lack of grip or there's too little material at the fore and pinky finger spots. I will say, it snap cuts really well so if you over-exaggerate the wrist flick, like one might for a light kuhkri, it does pretty well for "controlled chopping" like shaping sticks. It's beautiful; I may end up modding mine with some grip tape to build some girth or just to add a hint of grabbiness. Leonardo63, MacLaren1, jeepin and 3 others like this. Mine as well...excited to see it. Just received mine about 10 minutes ago so I thought I’d post a quick pic! Apocalyps, Hard Knocks, BeastClaw and 5 others like this. 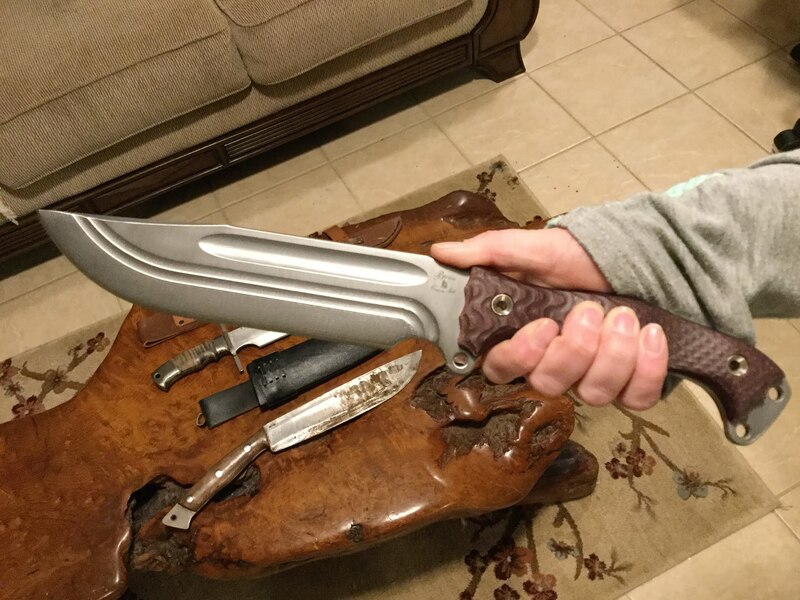 My Rambo knife came in today! It fits my hands perfectly! Apocalyps, Jagamov, Hard Knocks and 6 others like this. I came home from college about 2 hours ago (6pm) and the box was there next to the backdoor. Got to love living in the country where you can just leave packages and no one will come and get it, especially in middle of the winter. Opened it up and got it into my hands as quickly as I could. 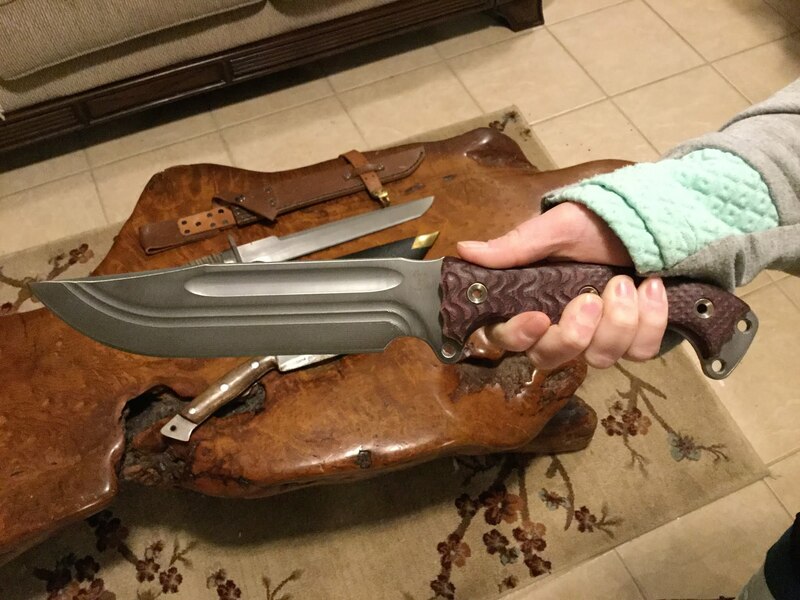 Wow...it actually fits my hand really well and feels very light and nimble while looking like a big Rambo knife. 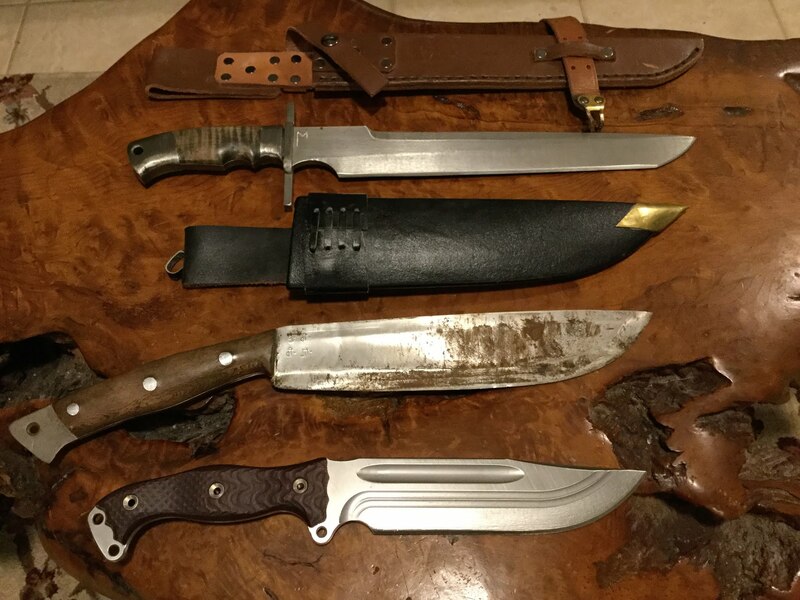 This is exactly what I've always imagined my imaginary knife will be like if I was to design one every time I watch some army movies including re-watching Rambo movies (one of my favorite movies). Can't wait to get it tested outside and pamper it with some nice sheath, maybe some battered war beaten looking sheath. Or a Fallout 4 theme sheath. Mmmm options options options. Twiztids4, nydude, Spider Monkey and 2 others like this. That's really, really, nice to know that she will baton so well. I was wandering about that. Apocalyps, zmbhntr, Leonardo63 and 9 others like this. That’s a beauty for sure! Can’t wait for my Custom Shops to get delivered! How much lighter is the custom shop compared to the regular one? I will say that I really love the blade shape, length, etc. And the grip is kinda growing on me already. But I honestly think, so far, that if it had the standard-size fusion grip, it would be my favorite blade of all mid-size blades. The size of the blade just begs for the fusion grip. Now, what I will say, after playing with the grip some more, is that the nano-fusion grip will be PERFECT for the NFNO. Yep. Perfect. MacLaren1 and bikerector like this. Got mine today. Like the handle. I think it will really fit well with the NO. Spent 3 hours with it on the WE tonight. Just finished putting a 22 degree edge on it. 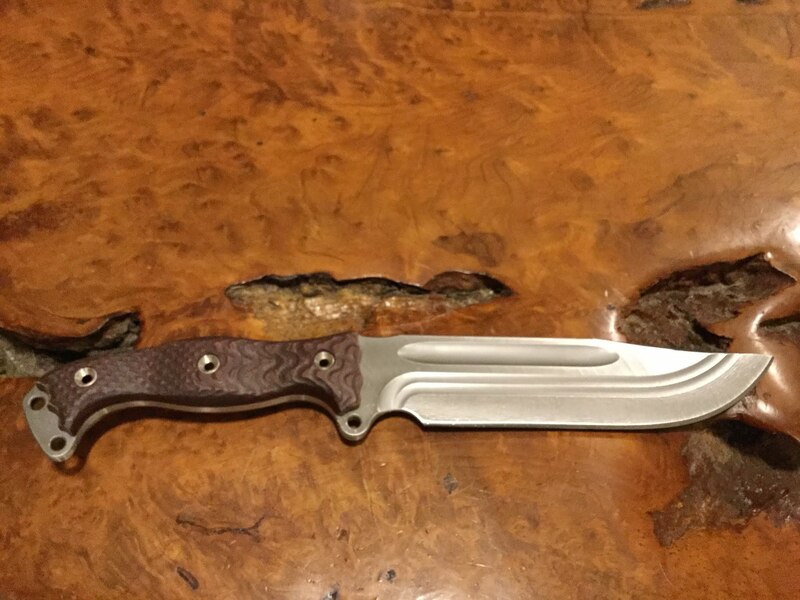 I will post some pics after I get the sheath made.